Lock in a great price for Business Hotel Rupinasu – rated 8.2 by recent guests! Excellent location. Excellent breakfast. Good value. They’ve got breakfast (japanese style) starting 6:30-7:00 and its super yummy! Just less than 5 min walk from Takamatsu Station and right at the center of everything, beside it is taxi and rental car so youve got no problem with transpo. The owner can even book for you but make sure you do it few days before your arrival. The toilet is the standard japanese size toilet, with bodysoap, shampoo and conditioner provided, tooth brush, toothpaste and hair brush also provided. One bath towel and one face towel. Theres a lift (which can carry 4-5 people) so humongous luggages not a problem. Large comfy room and the location can’t be beat. Breakfast made to order! The location - just opposite the bus and train stations, yet not in a noisy area. The breakfast is superb! The room is bigger than expected, and room has big windows. Had very good sleep throughout my stay. The ladies working at the hotel make sure your stay is comfortable and hassle-free, despite them not understanding English. I will definitely stay here again! Excellent Japanese breakfast. Right opposite to the train station. I loved the cooked breakfast in the morning and the lovely lady stored my baggage for me for the day after my checkout which was very much appreciated. The hotel owner serves a generous portion of either Japanese breakfast or western style egg, toast, coffee and yoghurt. Although the host cannot converse in English, she is a very kind lady and appears to generally understand what is said. Just across from the JR station, this is definitely a good base for travellers to explore the neighbouring islands and other places of interest inland. The pictures on Booking com don't do justice to this property. The rooms are bigger and more comfortable than shown. The right on the spot cooked Japanese breakfast is a solid start of the day. Business Hotel Rupinasu This rating is a reflection of how the property compares to the industry standard when it comes to price, facilities and services available. It's based on a self-evaluation by the property. Use this rating to help choose your stay! One of our best sellers in Takamatsu! Business Hotel Rupinasu is a 4-minute walk from Takamatsu Station and a 7-minute walk from the Takamatsu Castle Ruins. It offers simple, western-style accommodations with free internet access in public areas. Air-conditioned guest rooms are fitted with a fridge, a flat-screen TV and a pot with green tea bags. Free toiletries and a hairdryer are a standard in the private bathroom. Guests can use the personal computer at the lobby. Drinks can be purchased from the vending machine. The property serves a set menu for breakfast in the dining room. Rupinasu Business Hotel is within a 12-minute walk of Tamamo Park and Kagawa Museum. 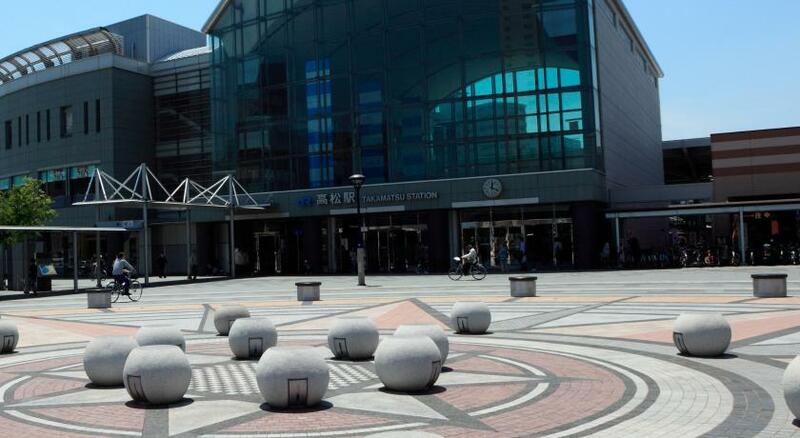 This property also has one of the top-rated locations in Takamatsu! Guests are happier about it compared to other properties in the area. This property is also rated for the best value in Takamatsu! Guests are getting more for their money when compared to other properties in this city. When would you like to stay at Business Hotel Rupinasu? Room is fitted with a fridge, a flat-screen TV and a pot with green tea bags. Private parking is available on site (reservation is not needed) and costs JPY 735 per day. House Rules Business Hotel Rupinasu takes special requests – add in the next step! Business Hotel Rupinasu accepts these cards and reserves the right to temporarily hold an amount prior to arrival. It’s quite basic by Japanese standard but then that is reflected in the price. The room I’ve requested is a non smoking room but when i turned on the heater it smells like cigarette. The pillow needs getting used to its not the fluffy pillow you’ve dreamed of but still i have a good rest (or maybe i was just super tired). The bathroom trash bin wasn’t emptied though, theres still old sanitary pads in it. Hot water is not 24 hour! Early in the morning & afternoon before 3 - no hot water. There is no sweet old lady. No one speaks English & the old lady could not give me a receipt! Far from the shopping area but near train station. If they have „Absolut no- smorking policy“ will be nice. There is an aschtray in my room. The breakfast is almost „hand-made“ by the receptionist ( she lookes like ‚Mother‘ ) The hotel is not modern but has a warm hospitality!! It looks like at home! Excellent location: every every close to main JP station. The room is generally clean and tidy.